Part of soundproofing a ceiling may involve repairing the squeaks in the floor above you. So, I bought the Squeeeeek No More kit. From the manufacturer, "Stops floor squeaks from the top of the floor by safely going through the carpet!" So here is the situation, my neighbors condo above me has some spots where the floors are squeaky. They are moving out, so they were nice enough to let me come in and fix the squeaks. So, I ordered the Squeeeeek No More kit. It came with 50 screws, joist locater (long screw with threads at the end), alignment and depth control fixture, and a special driver bit. So, I first started in the neighbors bedroom, where I have been cursed by this squeaky floor. I love waking up to a loud squeak at 3 AM. There was a wide swath of floor that squeaked when you walked across it. So, I started with the loudest squeak. The directions say that the first joist is usually 9 to 10 inches away from the wall. Mine was about 6.5 inches. From the first joist the directions say that the rest of the joist are usually 16 inch apart. This was correct in my situation. Instead of me writing about the whole process of using the product, please watch the video from the manufacturer. Once you find the joist, it is pretty easy to use the product from there. Unfortunately, I had only minimal success with this product in the bedroom. I had a hard time locating the exact spot where the squeak were. There seemed to be squeaks everywhere. 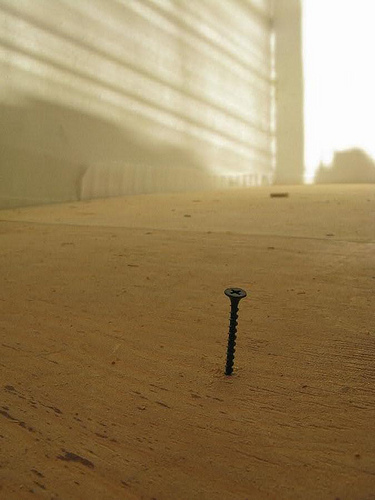 I used 35 screws on the bedroom floor with little results. I then moved onto the living room. I successfully located the first joist at 13 inches out from the wall. Again the there were multiple squeak everywhere on the floor. I attempted to locate the loudest squeaks. Again, I had trouble locating the exact spot of the squeak. I used 12 screws, with minimal to no reduction of squeaks in these area. Since, I was almost out of screws, I decided to give up. Well, I can say for sure that I did screw the floorboards into the joists. Maybe the product is not ideal for a floor with this many squeaks. Or one might chalk it up to user error. Anyway, I had dreams that I would screw a couple of screws in and voila! squeak is gone. It stayed just a dream. This product did not work for me in the situation I had. UPDATE: After doing a little research, I read that the squeak has to be located over the joist for this product to work. So, if this the case, this product may work for you. You can purchase this product at Amazon.com Click Here for the 100 screws and Click Here to purchase the kit with 250 screws. I've tried the product and it simply does not work. It has a fundamental flaw of having the threads all the way, therefore it can never tighten the gap. Just a waste of money and energy. fundamental flaw is your ignorance to details. the screw has 2 types of thread pitch. larger pitch at the bottom, smaller pitch at the top. and it will tighten the gap!! It's silly and obnoxious to write a run-on review in all caps. People who will be inclined to fix their own problems will likely have the skill to protect themselves from their home's internal utilities. The product WILL work if you follow the directions by first placing your weight over the squeeking floor board to take out the gap BEFORE you drive the screw. To the first poster, The screws in this product are dual pitch.8 threads per first inch and 9 for the second inch.So the top threads spin faster than the bottom, that pulls in the gap. To the second poster, Check standard building specs.There is no way you will ever hit electric or water systems with this product. Sometimes sub floor sections will lift from the opposite side you are standing on, so as you use your foot to make a squeak have a friend stand in other spots in the room to see if the squeak stops.If it does you go put a screw by his foot. It worked perfectly for me. I am not handy at all and I just watched the video and followed the instructions. I wish I had found this product earlier. I can't say if it only works for my situation, other users weren't hitting the right spots, or what, but this *definitely* worked for me. Unlike most of you, I'm happy with this product and was in the process of ordering more screws when I stumbled across this review. This process takes time and patience! Be CERTAIN you found a joist before you start screwing into the floor! You can't just fire screws into the floor everywhere you hear a squeak and assume it will fix it (the odds are against you - there's more empty space than joist). If the screw spins endlessly, it means you haven't hit a joist. "This Old House" has a good web video that shows you how to map out the joists. You also need to understand that this product, or any other above-carpet product, will not eliminate all squeaks. Some squeaks occur when the edges of two floor boards rub against each other in the empty space between the joists. A screw isn't going to fix that. The only way to eliminate those squeaks is to pull up the carpet and padding and strap the boards together. It also takes more screws than you'd expect (15x15 bedroom took all 50 screws). The product worked for me, it stopped some squeaks and nearly muted others to what I deem acceptable for a 50 year old house. And I never did place any weight in the area as I was placing the screws in. I had to do a little guessing to find the joists but once they were found I just measured 16 inches to find the next. And the screws that didnt snap off came of with a little tip of a hammer. First product I've bought in a longtime that actually Does what it says it will!! The more diminutive the solidified particles are, the less the harm. In any case, it is this extreme vacillation in temperature that hassles the cement establishment Floor repair and leaves entrepreneurs with extra costs. The very first thing to do when repairing your garage area ground and Flooring company getting rid of breaks and gaps is to create sure that the pattern, pattern, and other dust in the breaks are eliminated. Most repairs in overlay Floor repair ground surface are really minor. A glass may have fallen and gouged a little gap or the children may have scratched a toy auto, short wheels, over a little segment. The scratches and gaps are just surface harm however they without a doubt cheapen the once glossy excellence of your floors.